Conventional approach and thinking urged people to assume that Artifical Intelligence will replace human and design a new form of life. And when the legendary physicist, Stephan Hawking said: “I fear that AI may replace humans altogether” – that’s where many of us started to get fidgety. The words were wise, but for QA and software testing they portray a whole new image of AI implementation. No technology can ever replace its creator; the control is always within the reach! There is no need to feel attacked by AI as it won’t replace QA teams and experienced professionals. Instead of considering it an enemy, AI is going to be an ultimate support towards high computing, valuable performance, agility, time balance with more accessibility as well as accountability. It’s a good omen for a tester that the code he wrote to test application can be re-run again on every release. This actively saves plenty of time for them to track the number of bugs detected and how many of them need fixing. Instead, they can focus better on other important aspects of testing. You guessed right – thinking. But the chaos begins when you have to write the automation code which itself is a repetitive process. Introducing a new field in the form means creating a new test. Subsequently. When you introduce a new form to a page points in the direction of adding a test to check all the field. And when you add a new page, that indicates that the tester has to check each and every component of the form on that page to ensure that the quality perfect. So, the more tests there are, the possibility of them failing is more too. Therefore, it is important that you check each failed test in order to confirm if there is a real bug or just some a changes in the baselines made by the developer. It is important that the AI incorporated in your system has access to all the visuals because the better it interacts with your app, the more it will support automation testing. The autonomous system should allow AI access not only the snapshot of the Document Object Model (DOM) but also the visual image of it as well. The AI visualization is crucial as it sees the data your users are seeing. The practice can immediately notify changes that otherwise would be a manual effort. To reach this level of testing with AI, automation testers and strategists are required to opt for AI-specific frameworks to distinguish between a relevant and irrelevant change. Same is the case with test pass/fail procedures. Letting AI “visualize” the application means it checks the visual features of the app against a baseline. At Stage 2, AI tests against baseline changes test, as well as test the visual features of the page under scrutiny. But inspecting every test failure to see if it’s a “good” failure or just a bug can be a weary process, particularly if one change is revealed in various test failures. Therefore, your AI at Stage 3 should be to understand the difference in terms so that it becomes easy for the users of the app to comprehend easily. At this stage, AI should be able to cluster up changes from different pages because they are somewhat the same changes found in various test failures and would be better understood by the users. In addition, Stage 3 AI can indicate the human when the changes are the same and asks whether to approve or disapprove all the grouped changes. Summing up, at Stage 3 AI assists you to confirm changes against the baseline and converts the struggle into an easy effort. Stage 4 focuses on Machine Learning techniques to compare the changes made. However, human intervention is necessary here to inspect any failure or changes identified in the software app. At Stage 4, AI could only check the off-based app design such as whitespace use, alignment, usage, color and font, and layout. Also at this Stage, AI addresses other critical data basis as well. You can further check the data, such as the number of changes made till the time. Here, AI lets you know that in a specific test case, the change must be sorted out. However, this is possible when AI understands the visuals and underlying data associated with the app. It also understands when a test is passed and doesn’t require human confirmation. AI checks hundreds of test results and can see how things change over time as AI can verify multiple test results and inspect how patterns change with time. While implementing machine-learning techniques, AI can better detect any abnormalities in the data and forward them for human verification automatically. So far, we have seen human involvement in running tests, creating codes, and even verifying the change, but at Stage 5 AI runs the test suites on its own. From here onwards, AI will study the user engagement at different time intervals, visualize the interactions, and understand the system flow. Using ML techniques such as reinforcement learning, AI will be able to drive tests repeatedly. 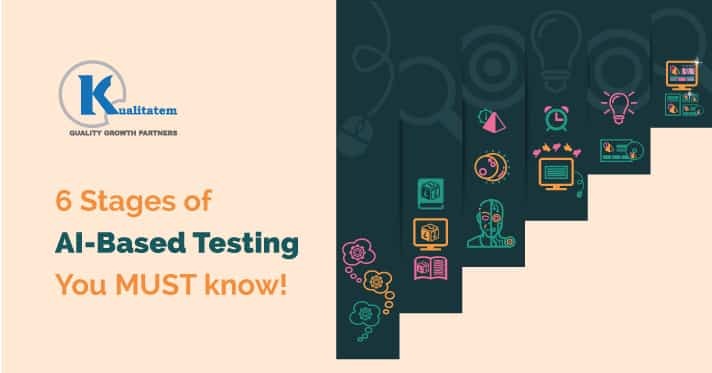 Not just the tests, but the AI will also be able to write the tests for the QA professionals. Ironically, this stage is yet to be explored further. At this stage, the AI can communicate directly with the QA team, understand the application better, and drive the test cases on its own. AI at this stage would need to be much smarter than that any product manager and any tech geniuses. So, those of you thinking that they should change their line of work, well, there’s nothing going on like that. If you think that AI will make software testing completely autonomous, that’s just a misperception! Software testing is more complicated for these AI systems to understand as better as humans. AI cannot completely grasp the concepts of testing, however, it can only automate certain tasks based on provided data. Dear testers, if you think that your jobs will be replaced by AI completely, think again. In fact, this is rather an opportunity for you to leverage modern automation techniques to speed up your work.